While Vancouver itself is indeed quite awesome, it’s our proximity to the awesomeness of other BC destinations that really kicks it up a notch. Years ago we launched “Super, Neighbours”, a series where we hop onto float planes, ferries, and the open road to bring readers outside of the Lower Mainland on travel adventures. The name is an obvious nod to Destination BC’s “Super, Natural” branding of our province, and upon doing a poll among our editors it became clear that the most “super” place that we all go back and visit is Tofino. It’s magic any season of the year and although it’s a bit of a trek to get there – 6 hours if you choose to drive onto the ferry instead of fly there – you’ll net some wonderful views during your journey from the city. The range of options for accommodations once you’ve reached this jewel on the western side of Vancouver Island is diverse and approachable from any budget. Camping on the beach, quaint B&B’s, beaches houses at places like Pacific Sands, $60 motels, luxury hotels like the Relais and Chateaux certified Wickaninnish Inn… there’s something for every traveler. Home to one of our favourite food truck imports (Tacofino! ), the culinary experience of Tofino is unrivaled, with most restaurants utilizing local ingredients, supported and encouraged by The Tofino Ucluelet Culinary Guild whose mandate is “to support the region’s farmers, fishermen and foragers to provide unique food experiences that rely on sustainable farm/boat-to-table practices and the freshest local ingredients prepared with integrity and passion”. They help put on a popular annual excursion for foodies and chefs alike: Feast BC! It’s a month full of events, dinners and workshops celebrating the local producers in the area. Beyond sleeping and eating, you’re going to find a ton of adventure in the area. 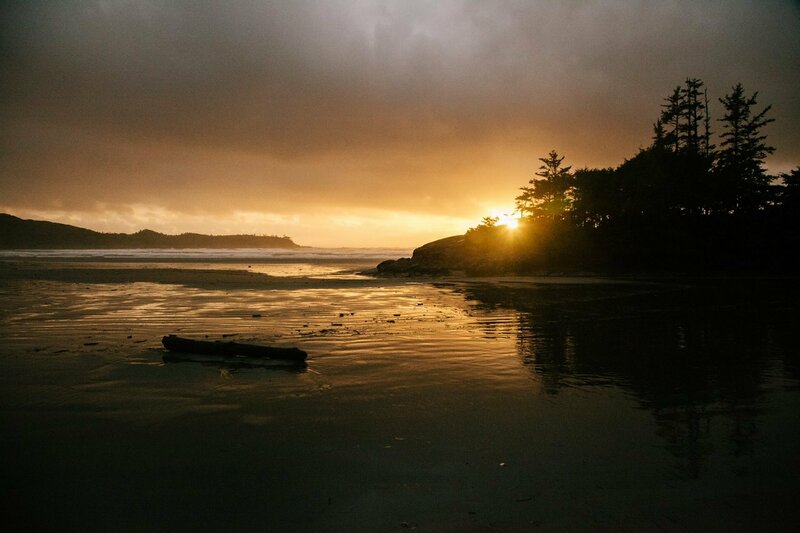 From simply beachcombing to fishing charters with folks like Cleanline Sportfishing, or simply finding your way into the Pacific Rim National Park to find what remains of a WWII bomber that crashed there decades ago, we think Tofino is the Most Awesome place to explore in British Columbia. BC’s Most Awesome place to Explore: Tofino! It might be a long journey, but that’s half the fun of escaping the city. BC Ferries helps you along from Horseshoe Bay to Nanaimo, and even offers vacation packages. There are so many interesting stops along your way to Tofino, including the old growth forest, Cathedral Grove. Since you’re staying in a rainforest, you can be sure there might be some rain (esp in Storm Watching Season!). There are so many cozy places to call home (like Pacific Sands, pictured) & dry off! There are so many local artisan food and drink makers in Tofino, it just seems right to bring your whole party over for some meats from Picnic Charcuterie and beer from Tofino Brewing. Tofino is full of trails and places to climb and explore, like Pettinger Point (pictured)! Time your expeditions right & you’ll see waves crashing, birds flocking, or the tide pools for exploring. Obviously the beaches are a huge part about what makes Tofino awesome. Take a stroll with your group, or try out surfing (lots of lessons and rentals available all over Tofino). Just play safe!